In Confirmation a person makes a mature profession of faith and is welcomed into full membership in the church by the Bishop with a blessing. Reception is a mature profession of faith made by a person confirmed in another denomination who desires to become a full member of the Episcopal Church. Both Confirmation and Reception bestow rights of voting and serving in particular church ministries. 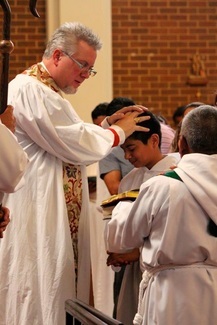 Confirmation and Reception are offered when the Bishop visits St. John’s. For adults and children 12-15 years old, a course of 10, 1.5 hour classes are required for both and are offered just prior to the Bishop's visit. For more information, contact Fay Jones at 512-836-3974.